As Europe’s most western country, Portugal is home to some truly incredible beaches. Beaches which look out over the Atlantic Ocean and from which you can see Atlantic waves crashing against their shoreline. These beaches of Portugal are truly beautiful, and might just be one of the best reasons to visit the country if you’re a scenery lover. Yet Portugal’s beaches tend to be one of the most forgotten about and not visited parts of the country. Because the country is home to some pretty amazing architectural structures and some deep religious history, these man-made destinations tend to come up first on the list of things to do. 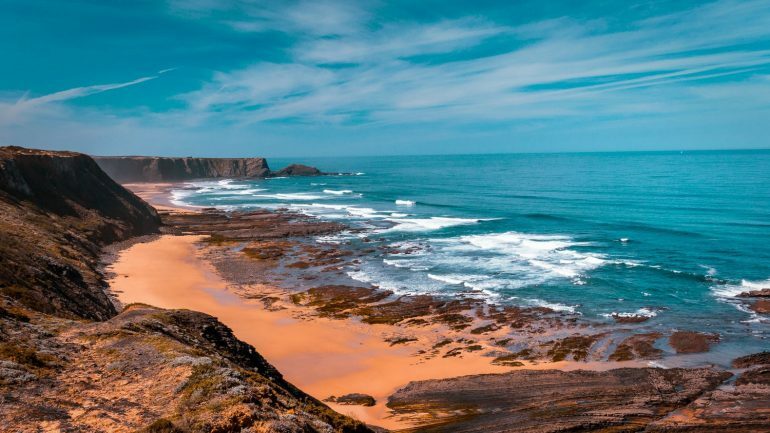 This means that not only are Portugal’s best-hidden beaches forgotten about, but Portugal’s best not-hidden beaches are also sometimes left off the list as well. Well, we’re all going to fix that, right? Below you’ll find some of Portugal’s best-hidden beaches (and some which aren’t so hidden) so that they’ll finally get the respect they deserve. The Praia da Baleeira is an almost secret cove located just along the Blue Coast of Portugal. The water here is the bluest you could imagine, whilst the cliffs are incredibly white. It might be because it’s not the most accessible beach that the Praia da Baleeira isn’t visited as much as some of the more popular beach locations in the area. However, if you’ve got what it takes and want to essentially have a beach all to yourself, then the Praia da Baleeira is for you. One of Portugal’s best-hidden beaches, and that’s why it’s often used by Algarve wedding planners to make something special for the couple. This beach isn’t quite as hidden as the others on this list, but it’s got an important sight to see. 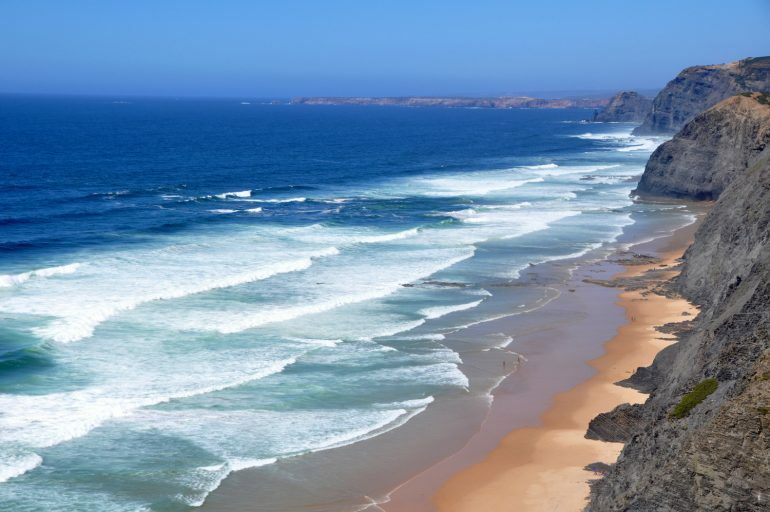 As Europe’s most westerly beach, the Praia da Adraga offers those who visit it a chance to see Atlantic waves break just off the shoreline. This is as they walk along its golden sands and admire the clear waters. Due to the fact that the Praia da Adraga isn’t quite so hidden, there are also several lovely restaurants located just next to it. If you would rather be sitting down and eating some lovely seafood, or sipping on some incredible wine, whilst watching the waves come in, then go right ahead. An interesting beach with some amazing waves. 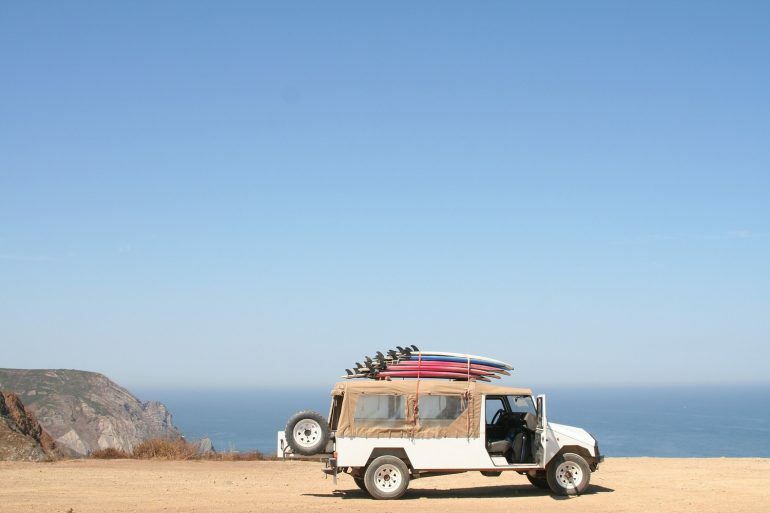 This tends to be the choice for surfers because of this and makes it one of Portugal’s best-hidden beaches for surfing. However, if you’re looking for a beach which has some people – but not too many – then the Praia da Arrifana is the right place for you. It’s that beach of moderation; it stays between a beach which is too crowded and one which is deserted. Of course, all type of beaches can be fun, but sometimes you just want a beach beach. That’s what the Praia da Arrifana is. The orange cliffs of the Praia da Arrifana are great for trekking over. Climb up them and take the coast path Aljezur or the Rota Vicentina. Both offer great views of the sea and beach. Afterwards, you can head down to the beach for a bit of relaxation. As one of the most popular beaches in the Algarve area, the Praia da Rocha is a beach for the whole family. It’s not just a shoreline with a place to swim but is home to a huge host of activities to keep the whole family entertained. The beach it’s is beautiful, with amazing golden sand and an unbelievable coastline, but hidden behind this are some interesting caves which run back into the hills overlooking the sea. Alternatively, the area offers some great restaurants and a nice little museum called the Portimão Museum. Head here to look at the different parts of the area’s history. It’s actually pretty interesting; for both children and adults. The Berlengas Archipelago is actually located off of the Peniche coast, meaning you’ll have to take a ferry to get here. Don’t worry, it’s an easy ride over and the waters here are relatively still. Of course, once you make it to the Berlengas Archipelago, you’ll be glad you made the journey. Not only is there an incredible beach, protected from the waves of the Atlantic due to its position, but there’s also the ruins of a 16th-century castle located on the island. Try kayaking through some of the island’s caves, if you really want to get the most out of this island. This 115-meter-long beach isn’t one of Portugal’s best-hidden beaches, but it is one of Portugal’s best beaches overall. 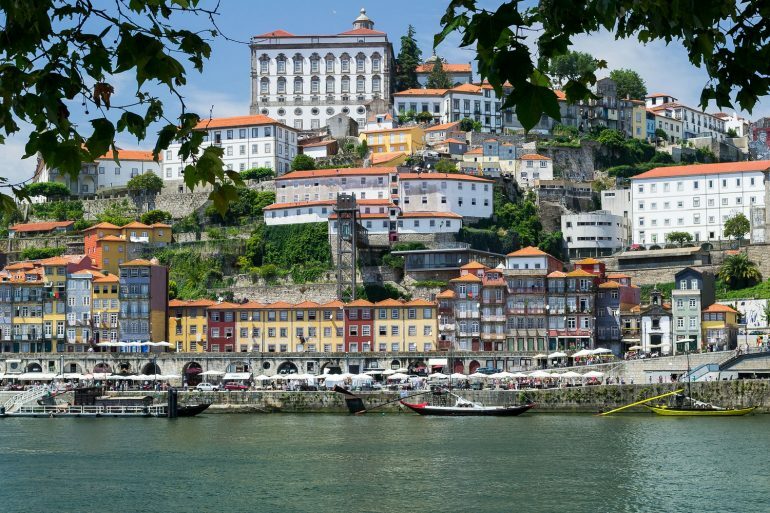 Located just next door to the romantic city of Porto, with its incredible sights and amazing architecture, Praia de Gondarém is just perfect for those looking to explore a part of Portugal which has just about everything the intrepid traveller could want. The beach itself is famous for its biodiversity. It’s also usually a little bust, and it’s quite rocky, so you might find it hard to get a place to sit down for a long time. However, if you just want to go for a stroll along the coastline, or sit down for a nice drink and a bite to eat at one of the adjoining restaurants, it’s just perfect. Ilha da Fuseta is like something taken out of a postcard. It’s a beautiful beach with some amazing sights. The sun sets in the background and the water takes on a clear blue sparkle, with a tint of green. It’s the kind of beach you probably think about visiting with a partner during the cool summer evenings. It’s romantic. As one of Portugal’s best-hidden beaches, the Ilha da Fuseta hides over 60 km worth of sandy islands, lagoons, and dunes. When the tide is out, you can always walk over the island. Make sure you make it back to the mainland before the tide comes back though, or you might just be stuck! Are you beach ready now? 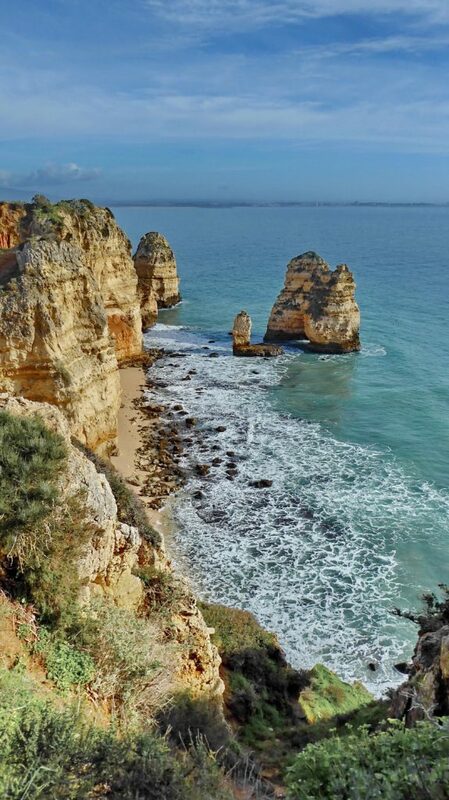 The Portugal beaches look so charming, and the stunning photos make me want to pay them a visit. Thanks for sharing. Portugal looks so beautiful, I didn’t realize it was so cliff-like.